Yesterday afternoon I arrived home exhausted and drunk. Exhausted by the energy exuding from Fergus Garrett and drunk on plants. I’d been to a ‘celebrity lecture’ organised by our Plant Heritage (NCCPG) group. A celebrity lecture is one where you pay £10.00 for your ticket and over 300 people had done so. I’ve never seen the hall at the community centre so packed. Fergus began by flattering his audience, saying that although he lectures all over the world, he loves coming to us in Dorset because we’re all ‘proper plants-people’. True. Great Dixter is now run as a charitable trust to which Fergus donates all the money he gets from lecturing. He needs the cash to support the students who work there for a year or more. And boy, do they work. Up at half past four, out in all weathers; the work ethic is very strong. That’s because Fergus feels that labour intensive, plant-centred gardening should be preserved. All the students there go on to greater things, so it’s the best possible training, somewhere which retains the feel of a private garden, as Christopher Lloyd always intended. The garden remains true to the Lloyd spirit but is always changing, as it did in his time. The theme of the lecture was garden planning and plant association. That’s where I started to become intoxicated by the plant names being fired at us and the rapidly changing scenes on the screen. Gardening Dixter-style means you must always be planning so that there’s never a dull moment or a gap in the borders. So seeds must be sown, cuttings taken, to ensure a constant supply of new plants. It’s a style of gardening which is at once rigorous and relaxed. Rigorous in the work involved; relaxed about self-seeders, about mistakes (because experiment is essential) and about neatness. You must also be aware of your surroundings. At Dixter, a country garden, the boundaries merge seamlessly into the fields around it. It’s the second time I’ve heard Fergus Garrett speak and this talk was even better than the first. If ever you get the chance to hear him, do so. You will come away inspired. Mum and I would love to go - maybe over Easter if the sun shines! I'm sure you'd both love it. You can fit in Rye on the same day! Sorry Barbara that was Miranda. I don't know what happened there! I think Fergus Garrett is a genius: a brilliant speaker and what he is doing at Great Dixter is incredible, the way (like Christopher Lloyd) he's always moving on and trying something new. Again like Lloyd he thinks garden rules should always be tested, never accepted, and the result is always breathtaking. I've just read your account of your visit to Great Dixter; I do hope you get the chance to go alone or with a well-chosen friend some time. We're lucky, one of our daughters lives close so we can visit often and without a doubt we liked the garden best in October when many plants have been allowed to go over or take over ... it was the most rewarding visit to any garden I've ever made. The man is a human dynamo. I'm hoping to go in October, when the garden should be looking great and there's also a plant fair. Lucky you to be able to go often; it's at least two and a half hours from here. I had the privilege and pleasure of meeting Mr. Garrett at a talk Christopher Lloyd gave in Massachusetts many years ago. Mr. Lloyd did most of the talking, but both were delightful. 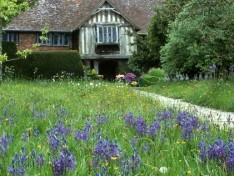 Unfortunately, I've never visited Great Dixter on any of our trips to the UK. Maybe next time. I hope you make that trip; it's a lovely part of the country with other interesting places nearby. That's a fine way to become exhausted and drunk! It sounds wonderful and I'm pleased you had such a great time. I'd love to go to see the house and gardens. It's over 120 miles away but is actually an easy route from Ely and approx 2.5 hours each way. Just about doable in a day. It's a long coastal road from here and too far for me to drive myself in a day, alas. There will be a coach trip later this year, though. Your reference to the Great Dixter work ethic shamed me into going out and doing some weeding! I'd love to see the Lloyd/Garrett garden in the flesh. Well done! A bitter wind has stopped me gardening this weekend. It is worth a visit and the house is very interesting, too. When I went, Christopher Lloyd was still alive and his study looked as though he'd just stepped out of the room for a moment. Fascinating old place, with some startling modern pieces around. Typical Lloyd, to mix it up indoors as well as out. Sounds absolutely wonderful, the talk and the way of working. Fergus Garrett really is a most remarkable chap. A genius with plants and with more energy than most of us are blessed with. Showing a working chart, he said, 'This is why I don't have a life,' but he's doing what he loves, all the time. Lucky man and lucky students.